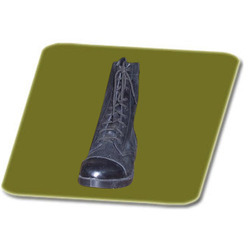 Leading Exporter of military leather shoe, black leather military shoe, military shoe and military police leather shoe from Ludhiana. With a specific end goal to cook the expanded requests of our customers, we have possessed the capacity to give a one of a kind scope of Military Leather Shoe. Our items are given to the clients in different examples and outlines. Our displayed shoe is made using the finest quality information that is acquired from reliable merchants of business sector. Our organization has come up with extensive and quality approved assortments of Black Leather Military Shoe to our prestigious clients. These products are trendy and eye-catchy in design. These offered ranges are designed using only high-quality materials under the supervision of our industry experts. In addition to this, the cost of offered collections is also very affordable. 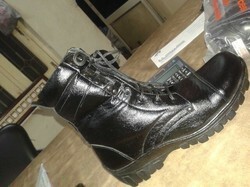 We are an organization in the anxious industry in offering an exclusive range of Military Shoe to our valuable clients. The offered range of Military Shoe is admired for their aesthetic appearance and attractive designs by our patrons. It is designed using best quality material and with the help of hi-latest machines and progressive technology. Apart from this, the best quality controller tests the complete range on various parameters of quality on defined norms. Banking on our skilled and experienced professionals, we are involved in offering a trendy range of Military Police Leather Shoe to our valuable customers. The range of offered products is designed using best quality leather which is obtained from the trusted vendors of the market. 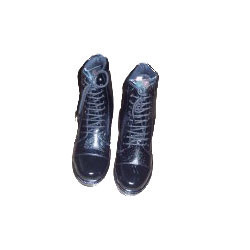 Extensively admired among the clients, these Military Police Leather Shoe are available in various patterns, designs, and vibrant colors to meet the various choices of our customers.